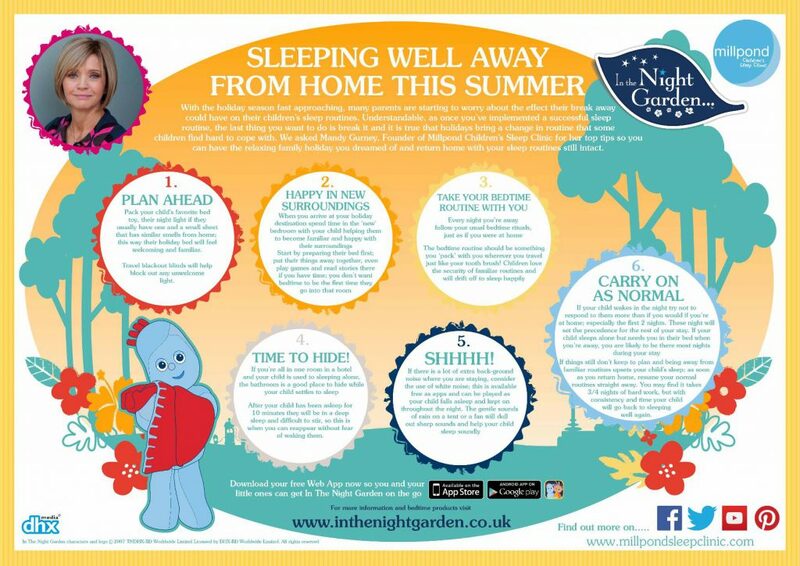 We are pleased to announce that Millpond Children’s Sleep Clinic has teamed up again with super popular children’s TV show, In the Night Garden to provide top tips on how help your children sleep well away from home and keep their sleep routines intact when you go away over the summer. See our founder’s, Mandy Gurney, top tips for how to have a stress free and sleep filled break away from home. One of the many things people say to you when you have a baby with sleep problems is ‘they’ll grow out of it’. But what if they don’t? What if that baby who doesn’t sleep simply becomes a child who doesn’t sleep? Alex Manson-Smith looks for solutions (before taking a nap).My five-year-old son won’t go to sleep unless one of us is sitting in the room with him. He wakes up and cries if it’s too dark (a downer, since he shares a room with his younger brother, who needs total blackout). And, regardless of what time he goes to bed, he gets up between 5.30 am and 6am. But while there’s plenty of literature and advice on what to do if your baby doesn’t sleep, less is written about what to do if your older child has problems. After all, the presumption is that, by now, these issues are sorted, and you should have a child who sleeps from 7 until 7 every night. This sounds familiar – most nights, after I put my son to bed, he’ll come down telling me he’s hungry or thirsty, or needs a wee. Andrea Grace, Harley Street sleep consultant and author of Andrea Grace’s Gentle Sleep Solutions, agrees that sleep problems in this age group are extremely common. For a parent, sleep problems can be insanely stressful. You know your child needs his sleep and, without it, will be vile tomorrow. You also know that your evening is short enough as it is, without having to spend it schlepping up and downstairs, trying to coax a reluctant child into bed. So you end up shouting at them, and it all ends in tears. Which entirely defeats the object, as the child now finds it even harder to sleep. “Bedtime, instead of being a nice, relaxing time, becomes very stressful and children start anticipating anxiety. If you’re stressed, you have an increase in adrenalin and cortisol, which will stop you going to sleep,” says Gurney. So, no matter how stressed you are, screaming at the kids – or shutting them in their room – is out. Both Gurney and Grace are agreed on this. “Bedtime should be as calm and loving as possible, and if your children experience you frequently losing control at bedtime, it may make them feel unhappy and unsafe,” says Grace. So what should you do? “We always talk about a bedtime routine with parents and make sure that it’s really quiet,” says Gurney. 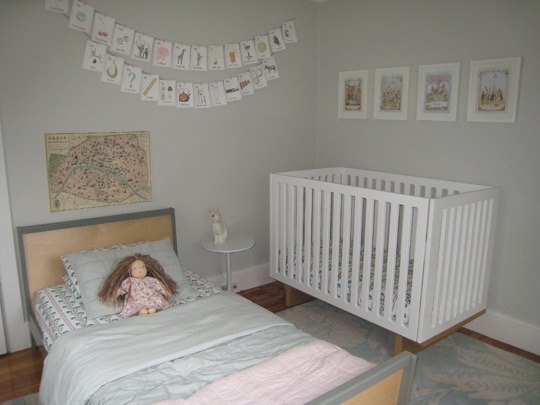 “Bedtime isn’t the time to talk about fears or even exciting things.” She also has her clients fill in a detailed questionnaire and keep a sleep diary, so that they can see exactly what time the child is falling asleep. Grace advises making a plan to tackle sleep problems. “In the afternoon, decide what’s going to happen at bedtime and what time it’s going to happen,” she says. “A repeated series of steps leading up to bedtime will help children of all ages to feel safe and sleepy, so encourage a nightly bath or shower, teeth cleaned, etc. Then they go straight to their room. Even older children will appreciate you sitting on their bed for a few minutes for a chat. Certainly I’m tempted. Because although sleep consultants can be expensive (consultations at Millpond start at £150, or it’s £285 for the core package), what price do you put on a good night’s sleep? Certainly if they could stop my son demanding I get up at 5.30am, it would feel cheap – after all, it’s a couple of meals out with friends that I would have been too tired to enjoy anyway. Alex Manson-Smith is a journalist, copywriter and blogger, and regular contributor toMr Fox. She has two sons, aged 5 and 2. We are pleased to announce that Millpond Children’s Sleep Clinic has teamed up again with super popular children’s TV show, In the Night Garden to provide top tips on how to keep your child’s sleep routines intact when you go away over the summer. See our founder’s, Mandy Gurney, top tips for how to have a stress free and sleep filled break away from home.